An excellent way to see the city and its different neighbourhoods. 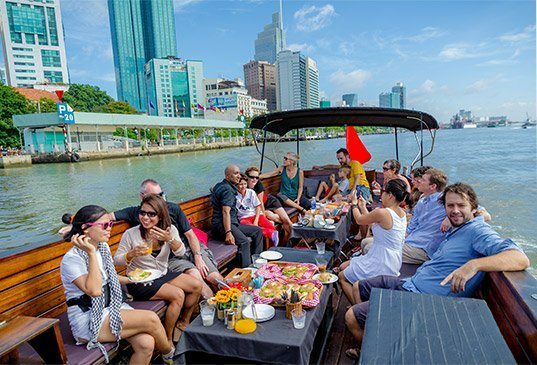 We take you on a 2 hour boat cruise along local neighborhoods, beautiful green areas, new urban areas and the impressive Skyline of Saigon. During the cruise we will serve you a delicious breakfast. If you want a short escape from the hustle & bustle from Ho Chi Minh and enjoy the sunset take this boat tour. We will take you along the city's richest neighbourhood, beautiful green natural areas and the skyline of Saigon. A great afternoon on the river and a fun & delicious night out in the city. 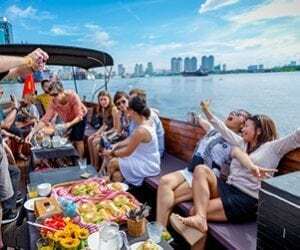 First enjoy a 2 hour sunset cruise on the Saigon River and then a 4 hour declicous food tour to the best street food restaurants while travelling on the back of a motorbike. Saigon River is one of the most beautiful parts of Ho Chi Minh City. Saigon Boat Company operates daily tours to explore this little visited place. We have a luxury open boat with a entirely wooden interior. Onboard we have a bar to serve you cold drinks. The boat also has a toilet and rain/sun cover. Join us for a unique experience on the water. If you have any questions please use the contact info below. The Saigon river is one of the best ways to explore Ho Chi Minh City. Visit places you would not be able to see from the road. We have a luxury open boat with a entirely wooden interior. Onboard we have a bar to serve you cold drinks. 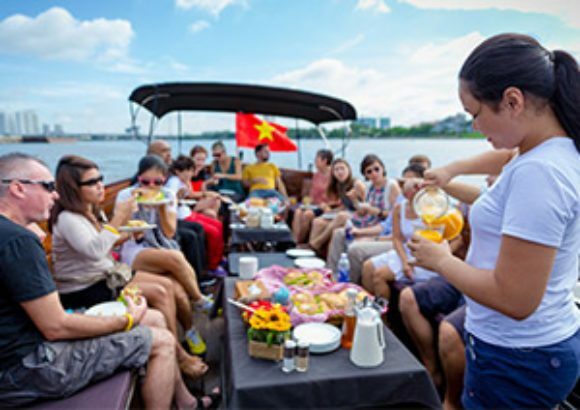 Our boat is available all year round for private charters or join in cruises on the Saigon River. The best way to start your day and see Ho Chi Minh City. We take you on a two hour boat cruise along green.. If you want a short escape from the hustle & bustle from Ho Chi Minh and enjoy the sunset take this boat tour. This tour is designed for anyone that wants to enjoy a luxury sunset cruise and a fun & delicious night out in the city. Saigon Boat Company has a beautiful open boat to cruise the Saigon River. The boat has a capacity of up to 27 people. The boat has a luxury wooden interior for convenient cruising on the Saigon river. Suitable for groups up to 27 people. Delicious food & snacks onboard. A foldable tent for rain and sunshine.